Here in Tahoe it has been very hot. Not compared to the areas in the valley but pretty hot for us locals. However, developement is still going on at a crazy pace as new areas keep being found and the list of projects waiting to go keeps getting longer. 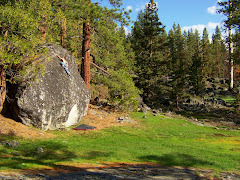 The Burnside area is very concentrated with good rock and problems of all grades. A new area very close to Erratica has been found with good volcanic rock and steep problems, one of which is a 20 ft horizontal roof called the Basement. Recently I also went back to one of my biggest aspirations, the angora project, this 40 ft steep highball over deep water is one of the best climbs on a hot day. The project is a 10 move undercling traverse to a steep prow with thrutchy moves that lead to a big dyno to a rail , followed by a hard top out into a sparsely featured slab. When this goes it will be one of tahoe's hardest and most unique lines around. It is so hard to concentrate on one thing though when there's so much new stuff being found constantly.